Considering this film was shot in English in Canada four years ago, it took the success of the "Gundum" animated series on Cartoon Network to prompt Bandai to release the film here. Produced to celebrate the 20th anniversary, the movie is remarkably good, considering how badly other Japanese co-productions have gone. “G-Saviour” boasts stunning CGI effects, a compelling story, and strong performances from a cast of mostly unknown actors (though Blu Mankuma is the most familiar face, having been in the "RoboCop" TV series). The most surprising thing about the film is the powerful orchestral score by John Debney and Louis Febre, who collaborated on the U.S. "Doctor Who" movie and "The Cape." Debney has also scored a wide variety of films including "Inspector Gadget," "The Relic" and the TV series "SeaQuest DSV." The bulk of the score is built around thematic material representing the dark and ominous Earth militia that threatens to claim a new discovery that will provide the only hope for billions of starving people. 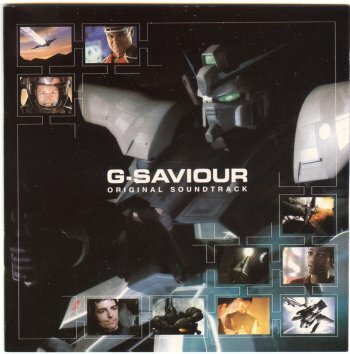 The "G-Saviour" theme is one of several motifs Debney and Febre use as a manifestation of the resistance force, the Illuninati. The music is as much driven by the characters as well. There is the continual hope for rising above oppressive Earth government, the growing attraction between mobile suit pilot Mark Curran and Dr. Cynthia Graves, and the ever pursuing evil of General Garneaux and the ambitious Lt. Col. Halle. Naturally, the film ends with a climactic space battle that allows Debney and Febre to pull out all the stops! As of this writing, Intrada has already sold out of their current stock on this CD and with Bandai’s release of the DVD, this soundtrack is sure to become a real collectable.